Metalguard provides elastomeric metal roof coatings as well as waterproof roof coatings since 1996. We help in sealing and coating the roof to stop metal roof leaks plus are also efficient in metal building repairs. Call us today for a free site visit. Metal roofing leak repairs waterproofing and metal roof coatings to stop metal roof leaks. Above, three buildings, 325,000 total sq. ft., sealing and coating completed May, 2015. Houston, TX. Leaking roof vent sealed on a standing seam metal roof. Stopping metal roof leaks is the surest way to extend the life of a metal roof. As a metal roofing contractor, we have sealed and coated thousands of leaky commercial & industrial metal roofs over the past 20 years. Our process is metal roof sealing and coating process is described below. We stop metal roof leaks by using our rubberized urethane sealant in a process that includes a reinforced polyester membrane. This creates a field prepared, self leveling membrane. When applied correctly this process really works, our supervisors make sure we maintain the highest installation quality levels, and we back it up with warranties. The system also includes replacing fasteners, replacing damaged metal, replacing damaged vent boots, and doing any other necessary repairs. We use metal roof coatings designed specifically for metal roofs to stop rusting and extend the life of the sealants. We also replace metal roofs when they cannot be restored with a roof coating. The Starting point is to ensure that the existing metal, steel, roof is solid. First, the surface is checked to make sure there are not any areas too far along in the aging process where the panels require replacement. If there are panels that are rusted thru, or too weak for walkable traffic, the metal roof panels must be replaced. For most roof panels, the rusting is the most advanced on the side of the panel facing the inside of the building. The damaged areas are found during a close physical inspection, and may not be obvious at first. One of the signs that advanced rusting has started is if you hear a crunching noise when walking on a panel lap seam over a purlin. The crunching noise is the sound of rusted metal. When too much of the roof is rusted-thru a total roof replacement might be necessary. A common area of premature roof rusting is at the eave. Often, due to improper installation of the water barrier between the bottom of the roof panel and the substrate at the eave, water gets trapped below the metal roof panel. Manufactures instructions dictate that the eave insulation is folded back to create a hem, using closures and caulk tape. Without this fold the insulation wicks water between the metal roof and the eave strut. This trapped water causes rust to develop. Another factor in deciding to replace a roof is if new insulation is desired. During a roof replacement, when the panels are removed, the insulation is exposed. The insulation is sandwiched between the roof panel and the roof perlins. When the panels are removed the insulation will most likely fall or tear during the process. This is the perfect time to give the inside of the building a bright new look. The thickness of the insulation is also typically increased, increasing the R-value. In some situations, the insulation might still be acceptable, however a new roof may be required. In this case it might make sense for a new metal roof to be installed over an existing metal roof. This may be the only option in some cases. This solution ensures that there is not any disruption to the production requirements of the business operations below. To waterproof a roof, all compromised panels must be removed and replaced, even if it's just a section of the panel. For small rust holes a patch might be sufficient. If the existing panel profile is no longer produced design changes must be made. Fasteners are inspected and replaced and added as necessary. To locate fasteners that require replacement we walk the purlin lines, replacing as necessary. Leaking roof fan sealed on a standing seam metal roof. After the integrity of the roof has been achieved, the roof is cleaned. All of the old, loose, materials are removed along with dirt and other debris. All areas of the roof that may possibly leak are then sealed. Fasteners, ridge cap, rake, internal gutter, skylights, vents, stacks, HVAC units, and any other roof penetrations. When required, seams are sealed.. When sealing around penetrations, ridge caps, skylights, rake edge, and other areas prone to leaking, the sealing material is reinforced. One or two layers of polyester scrim cloth are laid between multiple coats of the urethane sealing material. Multiple coats are necessary in some areas because the desired thickness/millage necessary can't be achieved with a single application. Urethanes will not cure properly is they are too heavily. The scrim adds additional, required, strength to these areas. While it is desirable to never have foot traffic on the roof it is impossible to avoid many routine maintenance activities. This foot traffic, the natural expansion and contraction of the metal due to temperature changes, and the UV rays of the sun are the ingredients that cause roof leaks. This is why it is very important the sealing material include features that can help keep a facility dry. There are a few products that can provide the desired results. If you just have a few leaks, you might eat to visit our Metal roof leaks repair page. We also have a service team for minor leak repairs. leaking metal roof stack sealed on a standing seam roof. The expansion and contraction on this standing seam metal roof caused an expansion in the fastener holes. Butyl caulk tape is installed at the fastener bolt/nut while at the same time allowing the drain channels to continue to flow. 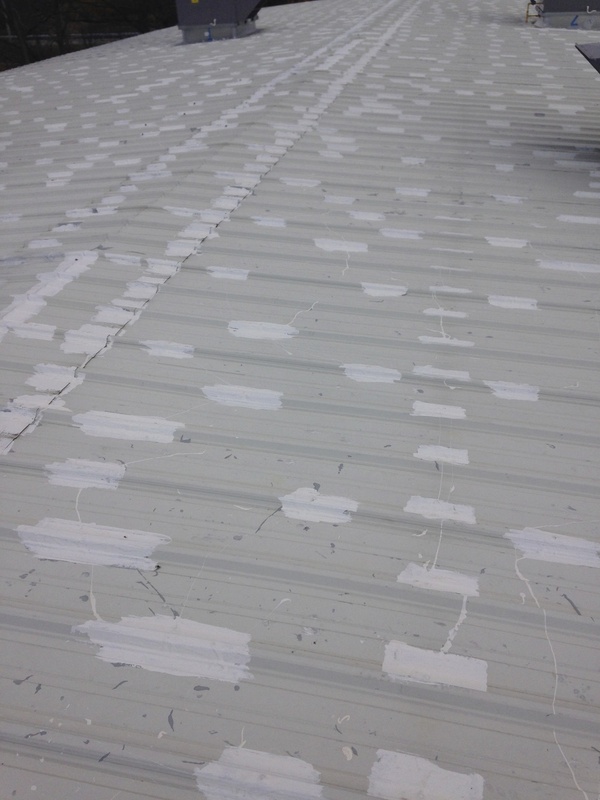 Elastomeric roof coating was applied after these metal roofs were waterproofed. Aircraft hangars, Toledo, OH. Above, aluminum roof coating over a sealed, rusty metal roof. Prior to the aluminum metal roof coating this metal roof had many leaks and was very rusted. Waterproofing and coating a metal roof, eliminating metal roof leaks, Houston, TX. Leaky metal roof repaired. The above complex is over 325,000 square feet. This project includes sealing the three buildings to stop all leaks. There were over 200 different leaks in the building. The building is currently leak free and the coating process is complete. Project completed May, 2015. We have experience with a wide variety of products from a number of manufacturers. The product lines include Uniflex Elastomeric white roof coatings, Kool seal, and Kool seal polyurethane sealants, Truco urethane sealants and elastomeric rubber roof coatings, Sherwin Williams, Tremco sealants, Vulkem, and roof coatings, ER Systems roof sealants, Aztec systems, 687 Enviro-White from Henry, Topps products, and GAF 322 Elastomeric Roof Coatings. We have experience with all of these products in stopping leaks from a leaking metal roof and extending the roof by applying a protective coating. Give us a call, we can tell you which one we found most effective. We have been coating roofs for 20 years, time is the test. After the pressure washing is complete the metal roof was sealed. The sealing product used was a rubberized urethane. It is important to note that after the sealing process was complete, before the coating was applied, the roof was leak free and water proof. Above, Elastomeric roof coating. Gray base coat, White top coat. Sealing process in progress, fasteners sealed on a exposed fastener, screw down roof. The most important element in stopping metal roof leaks is the care during the sealing/waterproofing process. The roof must be clean or the material will adhere to the dirt and not the roof. Some old materials can be sealed over, others require removal. The roof must be dry to bond with the roof. The sealing material must have the required strength to withstand the movement and abuse expected in that particular area. Industrial plant. On a standing seam roof leaks most often are due to leaks at penetrations. We can stop these leaks without coating the entire roof. This industrial facility, located in MI, is one of the facilities operated by the worlds largest automotive supplier. September, 2016. There are two types of professional metal roof coatings, aluminum and elastomeric. Some people also use paints. Paint will work as long as it is an elastomeric paint and you will never have snow and ice on your roof. Snow and ice will cause a paint coating to delaminate from a metal roof. Aluminum roof coating products vary widely. There are inexpensive versions sold at home improvement stores, try them at your own risk. The aluminum coating products we use are asphalt based and fibered. The coating not only includes a high quality aluminum flake, but also a high quantity of flakes. The quality and quantity of the aluminum flakes directly relates to the brightness and longevity of the coating. The product itself contains a rust arrestor, helping to make this a very cost effective option. The base of the coating stays soft and flexible for years because it is protected by the surface accumulation of the aluminum flakes. The system is bonded together by fiberglass threads. Elastomeric white roof coatings have a slightly higher reflectivity rating than aluminum. They are able to be tinted for a color match. If a rusty roof exists, a rust primer must be applied prior to the roof coating. Elastomeric roof coatings typically have a higher level of aesthetic appeal than an aluminum roof coating. Regardless of the coating used, the coating protects the sealing materials, and extends the life of the metal roof. We provide NON-PRORATED warranties on all of our work. The warranties can extend up to 10 years and includes labor and material. Metalguard uses the most efficient tools available. We strive to produce the highest quality product, at the most competitive price. The roof spray rig above is a Grayco 833 with a quick change unit. In this spray application it was configured to operate with two guns, with 700 feet of hose, thats 2 1/2 football fields of 4,000 psi hose. The longer hose lengths minimize the number of times it is necessary to move the pump, saving money. With the above rig we typically spray over 60,000 square feet of roof surface per day which is 600 to 800 gallons of roof coating material per day (the base coat has a different application rate than the top coat). Metal roof coating in process. White elastomeric roof coating. In the above picture the white top coat of the elastomeric roof coating is being applied. To the left you can clearly see the difference between the grey base coat and the white top coat of the elastomeric roof coating. Two coats are necessary for the product to cure properly. While working on a project, we place a high priority on respecting our customers facility. We do our best to minimize the area required for our operations. We clean-up as we go and do a general clean-up at the end of each day. We take great pride in waterproofing metal roofs. We have our own staff. The picture to the left shows the elastomeric roof coating. For this project we used the Uniflex Elastomeric industrial roof coating from Sherwin Williams. This project required 145, 55 gallon barrels of coating material. The roof coating cools the roof surface temperature by 35 degrees during a hot summer day in Houston. There is a very noticeable difference on the inside. Leak repair, rusty metal roof, metal roof replacement, replacing screws fasteners, replacing a metal roof please call. The GE/Momentive Enduris 3500 Silicone roof coating is another product we are proud to install, please call and we will be happy to share application information, solutions, and warranty information. GE Enduris 3500 silicone roof coating is a high performance protective barrier for a variety of architectural surfaces and roofing substrates. We offer chemical resistant coatings that resist corrosion either after as a coating to existing roof panels or new roof panels that have a coating applied to the steel coil. Call for details. We can match your environment to the best solution.